Have you ever wondered how much it costs to replace a physician in a hospital or a small practice? Compared to how much it costs to replace an average office employee, physician turnover can be quite expensive. And a medical practice that has a high turnover rate may lose a considerable amount of revenue. If you’re a part of the hiring process in a hospital or a small private practice, consider these factors when adding a new doctor to your staff. Doctors, including family physicians, leave their practice for a number of reasons such as: retirement, resignation, maternity leave, poor work environment, relocation issues, a desire for higher compensation, or unreasonable work schedule. And if a doctor leaves, a new one needs to be brought in immediately. When hiring a new physician, consider the costs of replacement, recruitment and training. These costs will vary by region and specialty, but it is estimated that the total cost of replacing one family physician is $250,000 which may include salary plus benefits, travel expenses for interviews, signing bonuses and moving costs if the doctor is relocating. Keep in mind, this figure doesn’t include the cost of lost referrals, gaps in patient care, interrupted work flow and low employee morale. To keep expenses low, it is best to recruit the right people from the outset with competitive compensation. Within the first three years of physicians’ careers, 46% leave their practices to move on to other – possibly more profitable – opportunities. If your organization or practice is recruiting new talent, offer recruiting incentives. This is generally done in a hospital setting where there is enough support to financially entice a new physician. Another way to attract candidates is by reaching out to local residency programs or programs where you trained as a student. Professors or colleagues may be able to point you in the right direction for a perfect candidate. Another way to keep your expenses from getting out of hand is to retain your current staff members. Try creating an inviting space where doctors and patients will feel comfortable. Bullies exist outside of elementary school and those bullies could cost your organization its reputation, in addition to lawsuits. In your practice, make sure that you have created a welcoming environment where problematic behavior will not be tolerated. Set up guidelines where problematic workers will be identified and consulted on how their behavior affects others. The cost of hiring a new physician is like an investment. 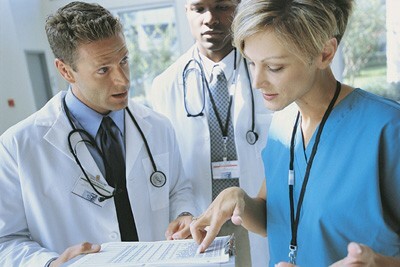 You are investing in this candidate’s ability as a skilled medical professional. When you’ve finally landed someone, it is imperative that they receive the proper training on the medical and billing systems you use. They should also know how to communicate with other staff members and become familiar with their new surroundings. Trainees can be a liability since rookie mistakes can lead to medical errors – usually due to improper patient hand-offs and poor communication. These mishaps can be avoided if they are addressed early. Physician turnover is a growing concern for many medical groups. Successful retention initiatives and effective recruitment strategies are key to building a top-notch medical staff that is willing to work and willing to stay.